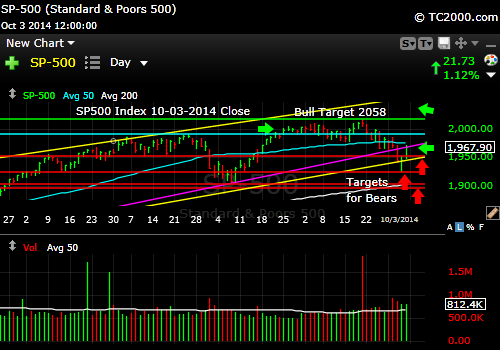 ← Market Timing Brief for the 9-19-2014 Close: Stocks Still Poised to Pull Back. Gold Headed to Bottom. Rates Falling Again? Market Timing Brief for the 10-03-2014 Close: Stocks Hit a Bottom. Gold AT the Bottom. Rates Still Low. The SP500 Index slipped to what I shared on StockTwits® and Twitter® (see links just below) was support at about 1928 and bounced. The actual low was 1926.03. We bought back part of what we sold there, thereby doing exactly what I claim is possible, which is buying low and selling high. Having some cash on declines can make you money, but only if you are willing to get back in. Bearish advisors often tell you to “GET OUT!” Unfortunately they stink at telling you to “GET BACK IN!” So discriminate when you listen to the broken clocks of the world. It is known that the most Bearish advisors are the worst, as the world never seems to go to hell and stay in hell! The Universe naturally and sometimes unnaturally repairs itself from its wounds. The Fed would be an example of unnatural healing! How do you keep your cool when stocks are plummeting as they were last week and buy when others are scrambling to sell? I’ll be sharing more on how that can be done in the coming weeks, so stay tuned. We added back to our model portfolio at 1930.46. I personally added by purchasing puts below the lows of the week, so I’m sure to get a discount if put the shares of SPY and will make a 12.4% simple annualized gain on the puts otherwise. To find out what I’m going, including buys and sells, please follow me here: Follow Me on Twitter®. Follow Me on StockTwits® You don’t have to make comments yourself to read my messages. SP500 hits support and bounces. Meanwhile, this is what this week’s investor sentiment survey at AAII says this about the bounce: Survey Says! What About Investor Sentiment? U.S. Small Caps are bouncing with the SPX despite valuation concerns (click the chart to enlarge it). Small caps lead the bounce. 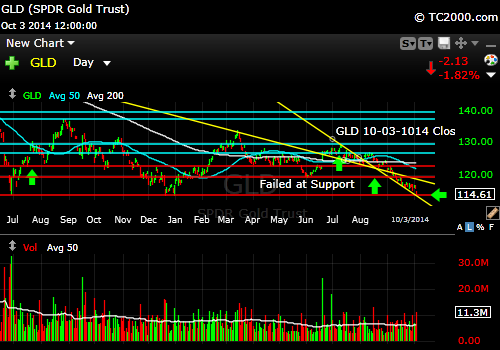 Gold: GLD, the gold ETF, is testing the massive lows we’ve been watching. The lows were: GLD 114.46 on 1-3-14, gold near month futures 1179.40 low on 6-28-2013, and spot gold’s low of 1192 on 6-28-2014. The spot gold price is JUST BELOW support at 1190.70, but we can consider that a retest so far. If we do not bounce quickly, gold could see far more damage. The other two lows mentioned have held thus far. Gold will turn up or not. If not, watch out below. Low rates should have helped gold and are not. Gold has been beaten lower even with lower rates. The main driver has been the U.S. dollar strength DESPITE falling rates. Investors are hiding in the U.S. dollars. Fear is rising worldwide it seems. This can reverse, but that is what has been happening. The dollar’s advance is not sustainable as our economy is going to take a currency exchange hit in the coming quarters as it is. That will make the Fed sit back and take it’s time in raising rates, which should pressure the US dollar. Gold needs to hold the lows. The 10 Year Treasury interest rate (TNX, tracked by TLT if Bullish; TBT if Bearish) could be forming a reverse head and shoulders and continue its bounce. That means rates rising with a recovering economy. 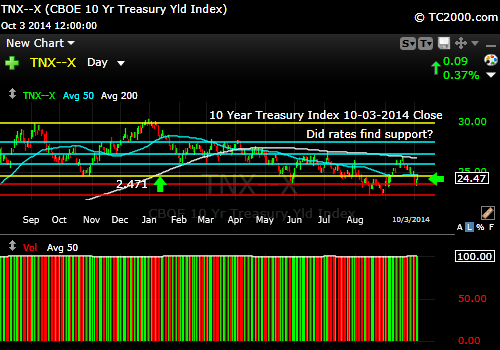 If you believe the opposite, you should buy bonds and Treasuries on every rally. 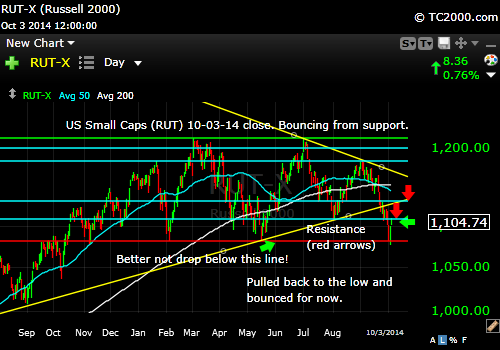 2.471% was resistance on Friday (bottom yellow line in chart below). Rates forming a reverse head and shoulders. Note that the newsletter is now closed to new subscriptions, but may be re-opened in the future. Stay tuned here in the meantime and follow all the action via the Twitter® and StockTwits® links above.